Heat oven to 350°F. Generously grease and lightly flour 15x10x1-inch baking pan. In large bowl, combine all cake ingredients; beat at low speed until moistened. Beat 2 minutes at medium speed. Pour batter evenly into greased and floured pan. Bake at 350°F. for 20 to 25 minutes or until cake springs back when touched lightly in center. Cool 15 minutes. While cake cools, in small saucepan, combine 1/2 cup jelly and amaretto. Heat over medium heat until jelly is melted. Poke holes in cake with long-tined fork. Spoon jelly mixture over warm cake, allowing it to soak into cake. Cool 45 minutes or until completely cooled. 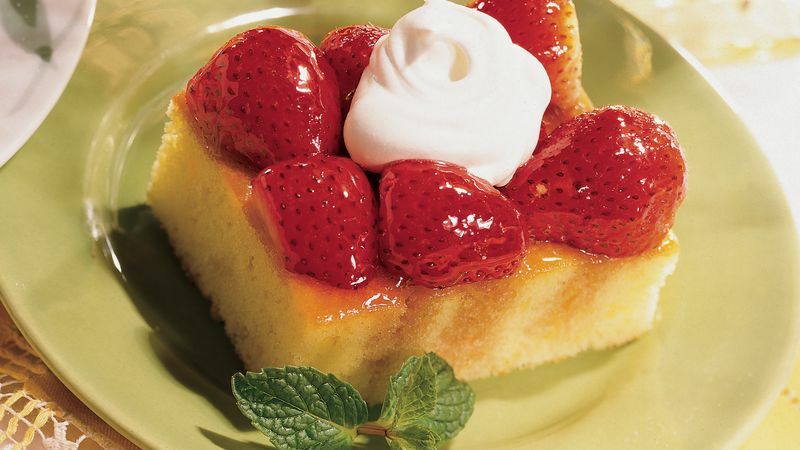 Arrange strawberries, cut side down, over top of cake. Spoon or brush 1/2 cup melted jelly over berries. Serve immediately, or cover and refrigerate until serving time. To serve, cut into squares; place on individual dessert plates. Top each with dollop of whipped cream. The cake for this recipe can be prepared ahead wrapped well and frozen. Add the strawberries and jelly just before serving, or up to 4 to 6 hours in advance. Refrigerate the strawberry-topped cake until serving time. To melt jelly with amaretto, place in 1-cup microwave-safe container and microwave on HIGH for 30 to 45 seconds.